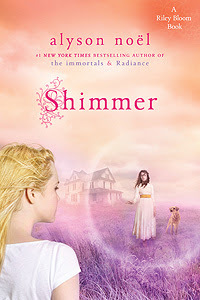 Shimmer was written by Alyson Noel. It is the second book in the Riley Bloom Series. If you're going to give this book a read... remember it's written for "middle grades". Riley is "12" and the author does a wonderful job of keeping her 12. As an adult who is far from "middle grades" I still enjoyed the story. It annoys me to read reviews by adults who expect the series to be something it's not. It is not racy. It is not a romance. It IS about the afterlife, and ghosts. AND it's about being a 12 year old who just might have to be 12 forever.... when all she really wants is to be 13. I'm enjoying the relationship development between Riley and Bodhi. Riley is sweet and innocent (everything 12 should be). She is also head strong and doesn't really like to follow directions. She's got her own mind (also kind of "12"). That tends to put her at odds with Bodhi alot of the time (since he is supposed to be her teacher and "supervisor"). I also really found myself interested in learning the background story of Rebecca. I couldn't put the book down because I just had to know her deal.